(Hanoi, Vietnam) – In response to a call for identifying useful solutions and setting up international worker safety standards from Boston Global Forum, a survey about requirements for working safety standards was implemented by with participation among more than 200 CEOs from Vietnam’s largest, fastest growth, and CIT contributing companies in the annual Vietnam CEO Summit held on August 23 in Ho Chi Minh City. The result revealed a dismally low minimal working safety requirement applied to these Vietnamese exporting companies. Workers safety is now a global awareness issue among all third-world countries’ outsourced suppliers to global retail giants like Walmart, Primark and Benetton. Since the tragic collapse of India’s Rana Plaza building that resulted in the deaths of more than 1100 garment workers, corporate giants engaged in retail operations are bent on relocating their operations away from developing countries like Bangladesh and India. Other companies unable to relocate have called upon the International Labor Organization (ILO) to insure that basic safety standards are met. Vietnam Report ISC completed a survey in response to this global worker safety mandate, among more than 200 CEOs from Vietnam’s largest companies, fastest growth companies, and largest CIT contributing companies. Many of the companies surveyed have import-export business with foreign countries in Asia, European Union, and in North America. They were asked to share information about importer countries’ requirements for worker safety standards applied to allow goods to enter the country. The survey reveals that the importing countries and respective companies have set low safety standards and minimal compliance in the requirement for all imported goods. Most of the companies interviewed expressed concern only for meeting technical requirements and avoidance of any harm to the environment in the manufacturing process. 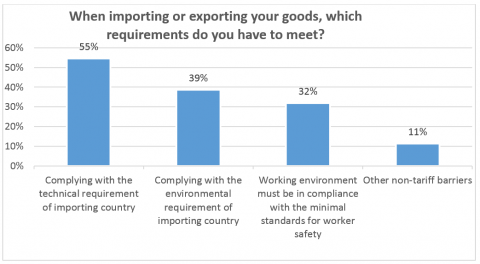 According to the survey, only 32 percent of exporters said that the importing countries include working safety standards as another necessary requirement for goods to be imported. The rate for this action is higher for the garment and footwear industry. In addition, 75 percent of respondents said that the current regulations and guidelines on worker safety from importers are too complicated to understand and not clear as to what measurements the exporting companies must meet. This result shows the need for clarification of working safety standard guidelines. All of CEOs also agreed that the ILO, European Union and/or U.S. government should develop and apply international standards that require all exported goods that enter the world trading system to be made in factories that meet minimal standards for worker safety. However, 77 percent of respondents expressed the desire that these international guidelines should be customized in terms of standards and applying time for different countries.